There has been so much controversy lately about TLC's show "Toddlers and Tiaras". So, I thought we would shift the focus to where it should really be -- on cats! Cats are the kings, and queens, of pageantry. Witness the King of the Beasts, himself, wearing his royal robes and crested with a crown befitting his status in the natural order. Dante is the true essence of pageantry. Next, comes Domino, not looking unlike many of those toddlers in tiaras, herself. She's wearing her best 'beauty' dress, though her true beauty is within. Her tiara is just a reflection of that inner sparkle! And then there's Dylan. Poor Dylan! Pageants shouldn't be used to over-sexualize your cats. 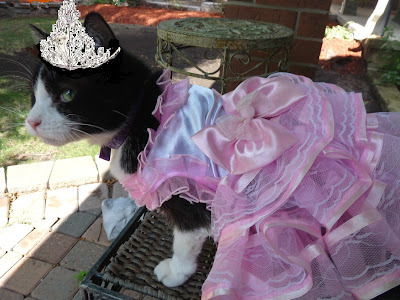 It's so PURRverse to make your cat wear a crown with their bikini. This isn't a freak show, you know! 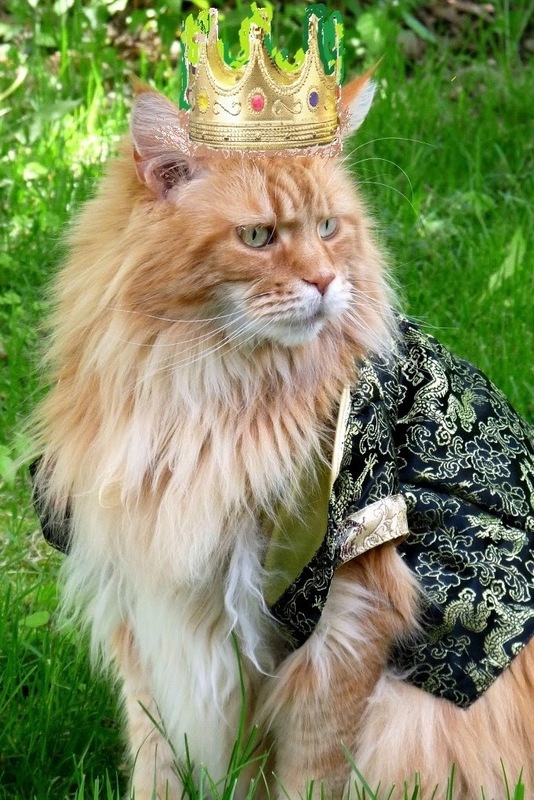 Come to think of it, cats don't need crowns either. They have already been blessed with natural beauty that needs no accessorizing. Their gorgeous and genuine fur coats are all the apparel they require. Like humans, their own hair is their crowning glory. Note: No cats were harmed in the making of this post. Your three need no crowns or cloths to be regal! Poor Dylan--you got the short end of the stick on that one, forced to "wear" the bikini top. LOL. Good thing it wasn't a real one! Nope, none of you needs any adornment, you're all purrfect au naturel! 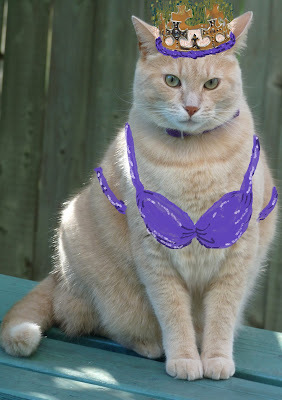 Me is still giggling over the bikini! Y'all sure look mighty royal to me! Have a happy weekend!!! Sheesh, Dylan, what was your human thinking?! Now I can't stop MOLing! the photos were hilarious but you are right, they need no additional adornment to be beautiful!